War is Personal is part of an ongoing photojournalism project by Eugene Richards and The Nation Institute. Their house, a suburban ranch with a wheelchair ramp running up to the front door, was, as far as I could see, the only one on the street flying an American flag. It had to be Brie, not her rebellious and haunted husband of seven months, who was responsible for this. It had been Brie who put Tomas's Purple Heart on display in a corner of their living room. After one ring Brie let me in, then said something about being tired after waitressing the night before and padded back toward the bedroom, leaving us alone. Tomas was sitting slumped over at the dining room table, eyes half closed, smoking a cigarette amid what he had dismissed as "my clutter"–newspapers, protest buttons, pamphlets from a veterans' support group that he planned to hand out, cigarette lighters, cigarette wrappers, bills to be paid. Struggling to sit upright, Tomas began forcing his thin, angular body as far forward and backward as he could. "Here I am wanting a conversation," he said, "and it's not working for me. I'm feeling kind of dizzy and thinking it must be the meds." Tomas recalled that the night before he'd taken a prescribed dose of Valium, along with his regimen of pain pills, antianxiety pills, antispasmodic pills and laxatives, only to awaken earlier than usual. At that time he took his morning dosages of morphine and Wellbutrin, and a half-dozen other drugs, before falling back to sleep. When Brie woke to remind him to take his morning pills, he forgot, in the confusion from a troubled sleep, that he already had. He'd "doubled up." Then again, maybe he hadn't. He struggled to explain that ever since his return from Iraq, it's been a kind of magic act for him to stay upright when the only parts of his body that will obey him are his shoulders and his arms. Plus, there are the days when his body is totally uncooperative, the days when he starts "bawling for no real reason." Tomas attempted to light another cigarette, since the last one had fallen on the floor, the one before that into his lap. His hand shook, he burned his thumb, but he wouldn't be deterred. "It's the nicotine, I guess. I need it to keep going, but I know I've got to quit. I'll be smoking in bed, even with Brie beside me, have a hand spasm and the cigarette will end up rolling under my back or legs, and, though I can't feel the burns, they can become pressure sores, can make you very ill…" Here his voice trailed off. 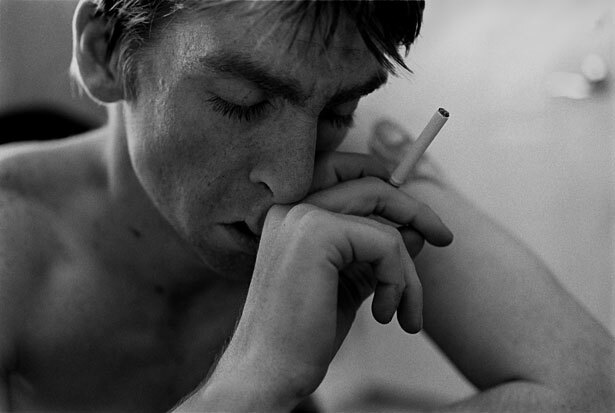 Increasingly irritated with himself, with the room already adrift in smoke, he finally managed to light up a cigarette, dropped it and began searching for it, plucking at his clothing like he had this itch, this terrible, unreachable pain. Just then, as the two of us grew silent, Brie walked in. "What are you doing with your shirt off?" she asked him. Tomas had pulled it off, knowing that I needed to take pictures. He had yanked it up. In three tries he had it over his head. 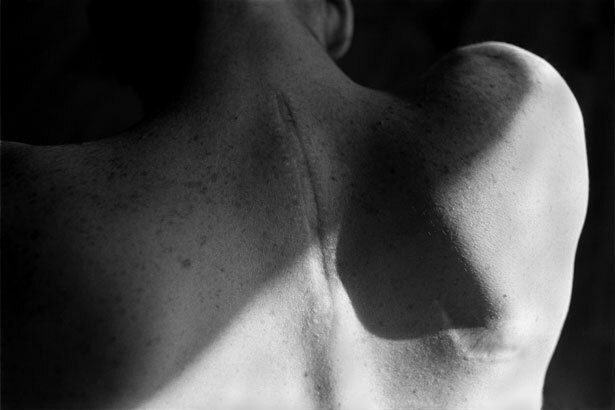 I could see the tiny entry wound the bullet had left in front just beneath his collarbone, the much larger exit wound in back below his shoulder blade, the wide, pale, zipperlike scar along his spine. 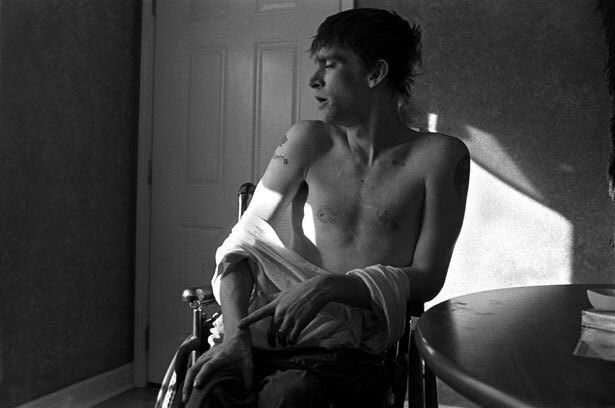 It was on April 4, 2004, his fourth day in Iraq, that his Army unit was ambushed. The place was the insurgent stronghold of Sadr City. The truck he was riding in, Tomas recalled ruefully, was unarmored and so crammed full of soldiers–twenty-five men in a space meant for eighteen–that he couldn't even point his weapon outside. Bullets began flying everywhere, splintering metal, striking almost everyone, when all of a sudden his whole body went numb and he saw himself dropping his M-16 and being unable to pick it up. There was no pain. It took only a few seconds more for him to realize that the thing that had just happened to him was something he would have to deal with for the rest of his life. He tried screaming for someone to kill him, but all that came out was this tiny whisper.